The geopolitical tension between the United States and Russia escalated rapidly in the past two weeks. Two weeks ago, the U.S. Treasury Department announced fresh sanctions against Russian oligarchs and companies due to “Russia’s malign activity around the globe”. This new sanctions have caused economic pain to Moscow with Russian Ruble and MOEX benchmark index plunging. Late last week President Trump seemed to dial back from his threat of imminent strike, perhaps as criticisms come that he should not tip this kind of decision in social media as it will eliminate any element of surprise. Or perhaps President Trump wants to wait for the weekend to carry the strike to reduce the impact on the market and allows market participants to digest the development without over-reaction. Over the weekend however, President Trump followed up on his threat. The coalition forces of the United States, U.K, and France launched a precision military strike in Syria. The strike was limited in scope and target three Syrian chemical weapons facilities. The U.S. was particularly focused on targets which do not involve Russian forces in Syria and reduce the risk of civilian casualties. The military action was designed to be limited in scope to deter the use of chemical weapons. The U.S and its allies do not want to get involved in the civil war which has raged for years in Syria involving militias, terrorist groups, and other world powers. It remains to be seen if the goal could be achieved and it will be interesting to see the global market’s reaction when it opens next week. 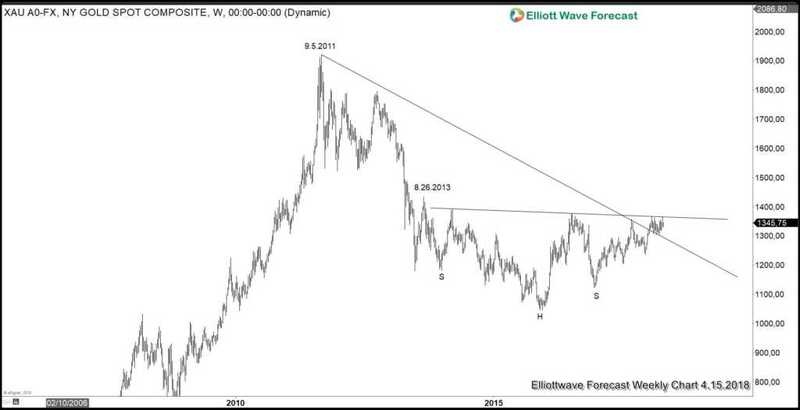 Weekly chart of XAUUSD above shows that the metal has ended cycle from 2011 peak, as seen in the break above the trend line. 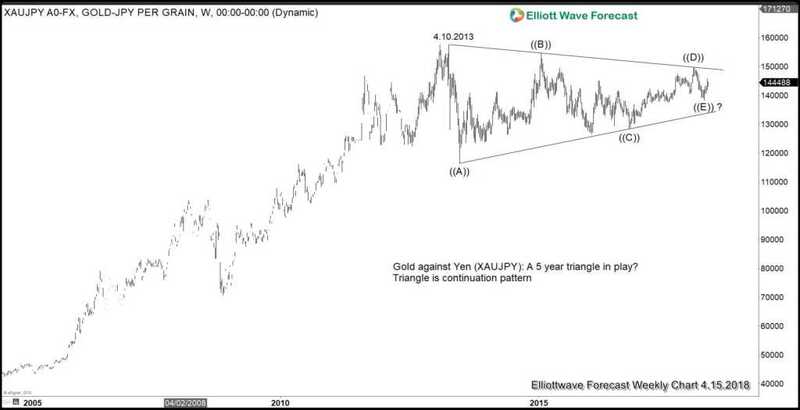 In addition, it has formed a 5 year base, an inverse head and shoulder like pattern. In the near term, it has not been able to break the neckline, but a break above 1/25/2018 peak ($1366) should give signal the next leg higher has started. In addition to the weekly chart which shows a 5 year basing pattern, XAUUSD daily sequence chart above also shows a 5 swing sequence from 2016 low, favoring further upside towards $1451 – $1529 area to complete 7 swing double three Elliott Wave Structure (WXY), provided that pullbacks stay above 12.2017 low ($1236.66). 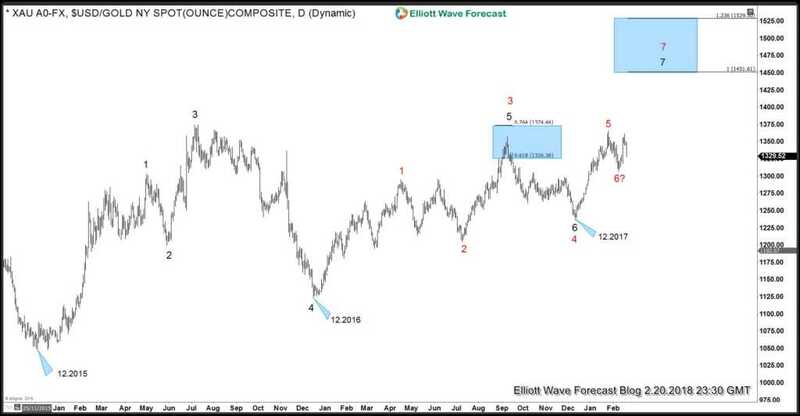 Please note that the number on the chart represents on the swing count, not an Elliott Wave count.